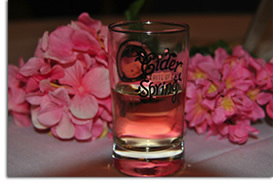 Best Northwest Cider Festival, Cider Rite of Spring, Returns! It's a Wrap, CiderCon 2017! 'Hunt' For These New Ciders! The team behind Texas’ first hard cider company, Argus Cidery, has launched a one-of-a-kind lagered Perry, entitled Vinho Pearde, in 750mL bottles. A 5.9% ABV offering, Vinho Pearde is unfiltered, unpasteurized and free of any back sweetening or added sugars in true Argus style. Vinho Pearde drinks demi-sec with a bit of residual sweetness, and slightly tart on the finish, balancing out one of the Argus team’s favorite house Perry styles. “Inspired by Vinho Verde, a young wine expressive in flavor, we set out to work within those parameters but substitute pears as the fermentable medium. Utilizing a lager fermentation process, it achieves ‘young wine’ characteristics in contrast to our previous year-plus aged large format releases. We were looking for tropical fruit notes with a crisp, citric balance to complement the slight sweetness and backend bubbles,” says co-owner and winemaker Wes Mickel of the new release. Argus Cidery’s Vinho Pearde, released under the company’s “Fermentables” label, can be found in select retailers and restaurants in Austin, Dallas – Fort Worth, and Houston, Texas locations. Additionally, the perry will be available in North Carolina, South Carolina, Georgia, Florida, Alabama, Louisiana, Washington DC, New York, Colorado, Missouri, Iowa, California, Michigan, Kentucky, Tennessee, Washington and Chicago, Illinois, as well as through the Shelton Brothers portfolio. Other fermentable offerings in addition to the Vinho Pearde large format bottle include can and draft offerings of Argus Fermentables Ciderkin and Ginger Perry. Argus just started bringing the big, bold tastes of Texas to the masses in Ardagh 12-ounce beverage cans last month. For more information, visit ArgusCidery.com. Buskey Cider began canning last month, producing the first 12-ounce six-pack of canned hard cider in Virginia. The first canned offering from Buskey Cider was their RVA Cider which was originally sold from the tasting room in Richmond, Virginia only. This month however, Buskey Cider rolled out can distribution in Richmond and other central Virginia locations through Loveland Distributing. Team Buskey chose a can design for Buskey’s RVA Cider that reflects their home of Richmond, Virginia. The can features the RVA skyline and the building where Buskey is made, located in the popular craft beverage neighborhood of Scott’s Addition. It also has a “VA Apples” seal on the front to show that the apples pressed to make the cider are local to the state of Virginia. 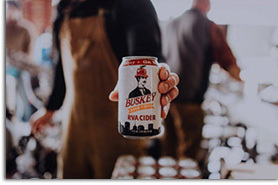 Buskey Cider selected their flagship, RVA Cider, as their first packaged product based on its popularity among customers in the tap room and around town. At 5.5% ABV, the RVA Cider is semi-sweet and immensely drinkable, balancing a beautiful yeast strain with a blend of fresh pressed Virginia Apples. In addition to the RVA Cider, distributed offerings include their off-dry 45 and Trying Cider, Nitro Cider, and Citra Hopped Cider. Additional limited releases will be introduced in the tasting room on a rolling schedule. For more information, visit BuskeyCider.com. Photos courtesy of Buskey Cider. As consumers look for ciders in package formats that are more easy-to-drink and conveniently pack for trips and events, we’ve seen the rise of cider in cans (as you can read about in our first two articles this month) and 12-ounce bottle four-packs. Two cider producers that made a recent launch of 12-ounce four-packs include Virtue Cider and Noble Cider. Virtue Cider announced the launch of The Mitten, the company’s award-winning bourbon barrel-aged cider, in 12-ounce bottles this month. This cider joins Virtue’s line-up of 12-ounce bottles that include Michigan Brut and Michigan Harvest. The Mitten, which was first released in 2012, is made with cider that has been aged for 11 months in Wild Turkey, Jim Bean and Heaven Hill bourbon barrels. The aged cider is then blended together with juice from freshly pressed apples from this year’s harvest for a touch of sweetness. The result is a 6.8% ABV semi-dry cider that shows off a balanced blend of charred bourbon and high-acid apple flavors. Pronounced notes of vanilla and wood mingle with overripe apple, and maple flavors create a warm feel. Hall has a long history of barrel-aging, having started bourbon barrel-aging beers in the 1990s at Goose Island Brewing Co., where he was brewmaster for 20 years. He brings this tradition to The Mitten, which was awarded Gold in the cider category at the Festival of Barrel-Aged Beers in Chicago, the first year the event included a cider category. The new bottles of The Mitten are currently for sale at Virtue’s Bottle Shop in Fennville, Michigan plus the Chicago area and throughout Michigan state. Similarly, Noble Cider was pleased to announce that its four flagship cider varieties are now available in 12-ounce bottle four-packs too! The Standard Bearer (crisp dry), The Village Tart (cherry), The Spice Merchant (chai) and The Golden Arrow (ginger) can be found by consumers through Noble Cider’s partner distributors come early March in North Carolina, South Carolina and Tennessee. Noble Cider invites the community to come celebrate the new bottle release on Thursday, March 9th from 3:30pm-10:00pm at the Noble Cider Taproom with live music from The Low Down Sires, delicious food from the Appalachian Chic Food Truck and a fun, royal photo booth. The first 100 four-packs sold at the Noble Cider Taproom will be numbered and signed by Team Noble. The company continues to partner with Dena Rutter Desin for flavor character development, label design, and now the new four pack cardboard carriers. Consumers can expect to see the continued bold colors and fun Noble characters throughout the new packaging. Baker adds, “When we began, our plan was to meet local Asheville consumer demand at the tap, alongside the area’s beloved craft beer. 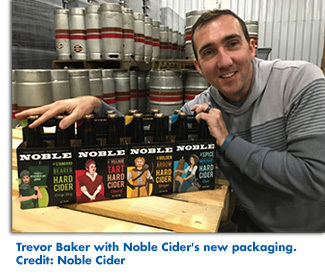 Now that cider continues to capture more of the beverage market share in retail, moving to 12-ounce bottles makes sense for our growth.” Noble Cider’s growth mirrors that of the craft hard cider industry growth. Currently at about 1% of beer retail sales, experts predict a 15% growth rate over the next five years, bringing cider to 2% of beer sales by 2020. Smaller local and regional cider companies are leading the growth in the industry, with an average of 48% growth in 2016. For additional information on Noble Cider’s new four packs and where to find them, please visit NobleCider.com. 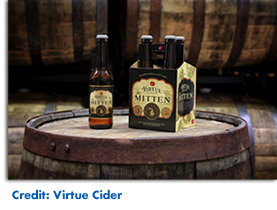 For additional information on Virtue Cider’s The Mitten, please visit VirtueCider.com. This spring, everything’s coming up cider! A celebration of the blossoming Northwest cider industry, the 4th annual Cider Rite of Spring will feature nearly 100 unique ciders served by 30 different cidermakers in a beautifully renovated historic event space. Cider Rite of Spring will take place March 25 from 12pm to 6pm at the The Evergreen PDX, located at 618 SE Alder St. in Portland, Oregon, for those 21 and over. General admission costs $25, which includes a tasting glass and access to cider. VIP Admission cost $40 and includes a tasting glass plus access to the exclusive VIP lounge, featuring complementary cheese pairings by Whole Foods Market and one-on-one interaction with six renowned Pacific Northwest cidermakers who will share special cider offerings. Tickets are available now via Mercury Ticketing. Wasabi Sushi will sell food on-site, including gluten free and vegan options; and a pop-up retail store will give attendees the chance to buy their favorite ciders from the event to take home. Cider Rite of Spring 2017 is presented by Square Mile Cider and supported by Valley Processing. 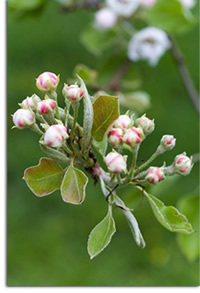 For more information, visit the Northwest Cider Association online at NWCider.com. 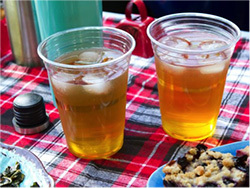 Photos courtesy of the Northwest Cider Association. 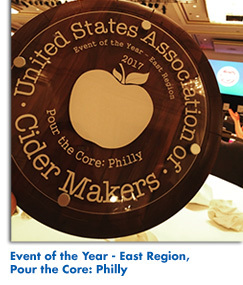 Organized by the United States Association of Cider Makers, CiderCon was created to offer the commercial cider industry an outlet to meet, share ideas, collaborate and effect positive changes in cider making and cider fruit production best practices, the cider market and cider regulations. CiderCon allows cider producers to meet their industry colleagues to discuss and exchange ideas on practices, innovations, and trends to provide the foundation of a strong and diverse industry. 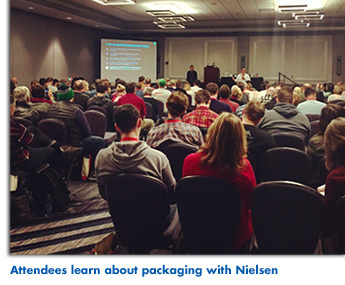 At the 7th annual CiderCon held in Chicago earlier this month, over 800 people attended the two day conference and tradeshow. Cider producers from eight countries (Argentina, Austria, Canada, France, Kazakhstan, Mexico, United Kingdom and, of course, the United States) all convened in Chicago’s Loop at the Hilton Chicago. Attendees were from 37 states with Michigan, California, Oregon and Illinois bringing the most representatives. The trade show portion of the conference more than doubled in size this year with 90 vendors and 220 vendor representatives (not included in the 813 conference attendees). Everyone from cider associations, publications, equipment, yeast and apples were at CiderCon in support of the cider industry and to network. These board officers will have enhanced leadership roles for the association in 2017, including a close working relationship with the association’s Executive Director, Michelle McGrath. Board members are elected to two-year terms. Seven board members return to the 2017 board to carry out the remainder of their terms as regional chairs, larger producers or at-large members. Three board members – Mike Beck of Uncle John’s Cider, David Cordtz of Sonoma Cider and Justin Kissinger of Heineken – retired their service to USACM this year. The United States Association of Cider Makers also announced the online launch of the Cider Certification Exam for industry professionals at the kick-off of CiderCon 2017. With hard cider’s popularity dramatically increasing in the last several years, there is now a way for food and alcohol industry professionals to prove their cider knowledge – the Cider Certification Program (CCP). The United States Association of Cider Makers has released CCP as an online exam that allows test takers to become CCP level one certified. Exam questions fall into five categories: apples, processing, fermentation, taste and style, and history. The exam is 60 questions long and costs $75 for non-USACM members. 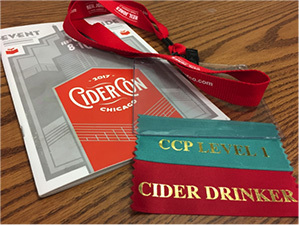 CCP was launched initially in Portland, Oregon at the 2016 CiderCon. Over two hundred people were certified during that pilot launch. The association’s CCP committee, comprised of professional cider makers, has since worked to deepen and strengthen the question base. The association plans to roll out levels two and three over the next couple years. 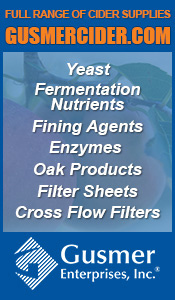 For more information on CCP, you can visit the association’s website at CiderAssociation.org. 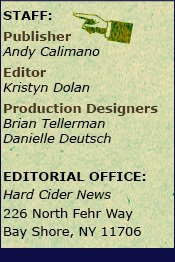 You will also find information on next year’s CiderCon on the USACM’s website… see you next year in Baltimore, Maryland as the conference hits the East Coast! Photos courtesy of Kristyn Dolan. This month, we were introduced to several very innovative and tasty new ciders from Wyndridge Farm Brewing, Vermont Cider Co., Portland Cider, Angry Orchard, 1911 Established, and Champlain Orchards Cidery among others. Be sure to look out for these ciders in your market or request them at your local retailer, bar or restaurant! 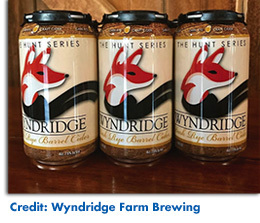 Wyndridge Farm Brewing launched a new line-up of seasonal, farm crafted beers and ciders with the debut of The Hunt Series, inspired by Wyndridge Farm’s natural beauty and its iconic mark… a scarf-wearing fox. The essence of the elegant, sly and crafty fox captures the spirit that is Wyndridge Farm. “The Hunt Series represents a significant milestone for Wyndridge Farm Brewing in our continued effort to expand our seasonal program. We are excited to be offering The Hunt Series as our first canned product. Cans give us the flexibility to bring a wide variety of new products to market while also providing our customers with a package that can easily be enjoyed in the great outdoors,” said Steve Groff, Wyndridge Farm owner. The Hunt Series will roll out new beverages throughout the year starting with a Dark Rye Barrel Cider. Other Hunt series cider releases this year include a Pear Cider, Mojito Cider, and Farmhouse Grapefruit Cider. Wyndridge Farm’s Hunt Series Dark Rye Barrel Cider has a 7.5% ABV and is available in 1/6 bbl. and 1/2 bbl. draft, in addition to cans. The cider will be served from now through April wherever Wyndridge Farm ciders can be found throughout Alabama, Washington DC, Georgia, Maryland, New Jersey, North Carolina, New York, Ohio, Pennsylvania, Rhode Island, Virginia, and West Virginia. Visit Wyndridge.com for additional information. Similarly, Vermont Cider Co. released their latest seasonal installation within their barrel-aged series, Cerise, which will become available March 1st. Cerise infuses Vermont Cider’s small batch hard cider with the juice of Michigan Montgomery tart cherries. It is then aged in the finest Napa Valley Cabernet Sauvignon barrels, for a complex taste that’s both sweet and tart with notes of oak. Cerise is a 6.9% ABV rare and limited offering. It has an aroma of ripe cherry, lightly toasted oak and vanilla. The taste of bright acidity, tart cherry, oak and vanilla provide a medium bodied mouthfeel. Cerise is available in 12-ounce bottle four-packs, 24-packs, and 5.2 gallon kegs. 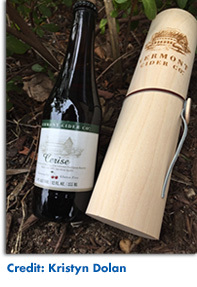 For additional information, find Vermont Cider Co. online at VermontCiderCo.com or on Facebook, Twitter and Instagram. 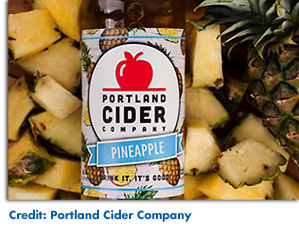 Portland Cider Company announced that the company will be releasing 22-ounce bottles of its seasonal ciders for the first time, beginning with their new Pineapple cider. Like a sun-filled day cruising down the Valley Isle, this pineapple cider brings a tropical oasis to your mouth. Sweetened with 100% fresh pressed pineapple juice, this seasonal cider calls for a little paper umbrella. With a semi-sweet finish, this 6% ABV fruit cider pairs beautifully with barbacoa pork quesadillas, Asian chicken salad and, of course, traditional Hawaiian foods like mac salad and Kahlua pork. Other seasonal 22-ounce bottle releases for 2017 include: Strawberry, Pumpkin Spice, and Cranberry. Portland Cider fans can find Pineapple bottles at select retailers within the brand’s distribution area or either taproom. Portland Cider is currently distributed in the states of Oregon, Washington, Colorado and the Los Angeles area of California. Pineapple comes after Portland Cider Company also released a new year-round cider, Sangria, last month. Sangria contains a variety of fruit juices, including orange, strawberry, pear, passionfruit, elderberry, and lime, combined with Portland Cider Company’s award-winning Sorta Sweet cider made from 100% Northwest apples. The 5.5% ABV cider is available in 22-ounce bottles as well and draft kegs. It has a semi-sweet finish that complements dishes such as herb-crusted grilled chicken, strawberry spring salads and creamy risottos. The release of Sangria was the result of Portland Cider Company fans asking for a more fruity, sweet cider option. Owner Jeff Parrish and Davenport worked together to fulfill their patrons’ request. “This cider is a slight deviation from what we normally make so we put a lot of time and energy into creating a cider that met our standards of quality, while meeting the requests we were getting from our customers,” says owner Lynda Parrish. For additional information, check out PortlandCider.com. Angry Orchard announced the national release of its new seasonal hard cider Angry Orchard Tapped Maple, available now through April. Tapped Maple blends American culinary apples with a hint of maple syrup from Vermont maple trees for a not-too-sweet cider with a big, bright apple taste. Because cider making follows a seasonal path alongside apple trees and harvest, cider makers are especially tuned into the seasons. At Angry Orchard’s Cider House in the Hudson Valley of New York, the cider makers like to play around with adding seasonal ingredients to cider recipes to create unexpected, but seasonally appropriate, flavor combinations. For example, with Angry Orchard Tapped Maple, they took inspiration from the highly-anticipated late-winter tapping of maple trees to make something completely new. The base cider is made from culinary apple juice and is actually quite dry. The maple syrup – rich in flavor and natural maple sweetness – adds a delicate balance, and gives the cider a strong maple-forward aroma, and full, round mouthfeel. It’s a great flavor profile for the last days of winter leading into spring’s cool start. Tapped Maple (5.0% ABV) is made from apples high in acidity, the dry cider base is then backsweetened with maple syrup to achieve balance between contrasting flavors. This cider is made from a blend of renowned Pacific Northwest region apples including Braeburn, Fuji, Granny Smith, Gala and Pink Lady apples. Tapped Maple offers a flavorful contrast to dishes like southern fried chicken or pork tacos, but also pairs well with classic hearty desserts like bread pudding. 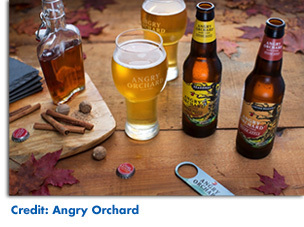 The seasonal experimentation also led to another new limited release cider in Angry Orchard’s Winter Orchard Sampler Variety Pack, Angry Orchard Spiced Apple. Spiced Apple combines a fresh apple taste with lively seasonal spices, much like a classic baked apple pie. A mix of culinary apples like Braeburn, Fuji, Granny Smith and Gala French, and bittersweet apples, such as Amere de Berthecourt, Beden, Medaille d’or, Michelin, and Binet Rouge were used in the making of Spiced Apple. Tapped Maple is now available in six-packs and the Winter Orchard Sampler Variety Pack nationwide through April. Spiced Apple is available as a limited release in the Winter Orchard Sampler Variety Pack through April as well. Suggested retail price for a six-pack is $8.99-9.99, and $15.99 – 18.99 for a variety 12-pack (price varies per market). For additional information, please visit AngryOrchard.com. Another recent release comes from 1911 Established, the award-winning Central New York cider and spirits company based in Central New York. 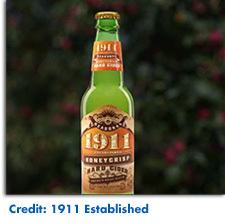 1911 announced the launch of its newest product, Honeycrisp Hard Cider, last month. Honeycrisp Hard Cider is one of the first single varietal ciders available in six packs from the company. Beak & Skiff Apple Orchards, which is the parent company of 1911 Established, grows and presses the apples on site. “Honeycrisp cider is a challenge to the traditional view among cider makers on what apples are ‘appropriate’ to use. By defying conventional wisdom we have been able use 100% fresh pressed Honeycrisp apples from our surrounding orchard and with the Honeycrisp’s naturally high sugar content it translates well to the fermentation process,” said Yann Fay. 1911 Established Honeycrisp Hard Cider is available in 12-ounce six-packs. For additional information on Honeycrisp, visit 1911Established.com. 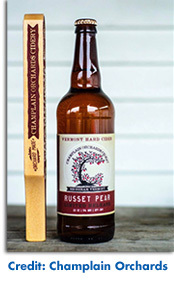 The final release we’re covering this month is from locally-run Champlain Orchards Cidery from Vermont which announced their newest limited hard cider, Russet Pear, will be officially released March 1st at The Farmhouse Tap & Grill in Burlington, Vermont. The blend, which features Asian pears grown on the Champlain Orchards ecologically-certified orchard, marks the cidery’s first limited release of 2017. The cider will be available on draft and in 22-ounce bottles at select retailers across the state and in Champlain Orchards’ Farm Market (Shoreham, VT). Russet Pear is clean, smooth, and light, featuring a bouquet of tropical fruits and lime, and has an ABV of 5%. Visit ChamplainOrchardsCidery.com for additional information. From Trisha’s Southern Kitchen (Episode: Tailgating). 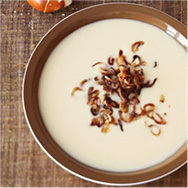 Photo Credit: Food Network.